How It Works – DinnerUp.com – It's Time to Eat! DinnerUp serves warm ready to eat nutritious meals in reusable service dishes, delivered to your door in thermal catering totes. No shopping, no prepping, no cooking or cleaning. Time spent with family is why you work hard to put food on the table. Save the leftovers and set the Tote out on the porch. 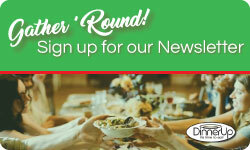 DinnerUp delivers the Family Dinner Hour! Order by Noon for Same Day Delivery!